Prime Minister Dr the Honourable Keith Rowley left for London on April 15, 2018 to attend the Commonwealth Heads of Government Meeting (CHOGM). The accompanying delegation included Minister of Foreign and CARICOM Affairs, the Honourable Dennis Moses and Minister in the Office of the Prime Minister and the Attorney General and Legal Affairs, the Honourable Stuart Young. In addition to the CHOGM agenda Dr Rowley also engaged in a series of meetings with energy companies during this period. This in keeping with Government’s thrust towards continued strengthening of Trinidad and Tobago’s position in the energy sector. Minister of Energy and Energy Industries, the Honourable Franklin Khan joined the delegation for these discussions. While in London, Prime Minister Rowley also took the opportunity to engage in meetings with British officials on matters of national security; engage in bilateral talks with other Commonwealth nations with a view to establishing and strengthening partnerships that will redound to the benefit of the people of Trinidad and Tobago as well as meet with representatives of the diaspora who reside in the United Kingdom. Here are 10 things achieved by Prime Minister Rowley in London. Prime Minister Dr the Honourable Keith Rowley and the Prime Minister of India Narendra Modi engaged in bilateral discussions in London. The leaders expressed interest in partnering in the areas of information communication technology (ICT), energy and pharmaceuticals. India was also invited to participate in an exciting new model for healthcare training in Trinidad and Tobago at the Couva Hospital which could include the teaching of traditional Indian medicine. Trinidad and Tobago is set to benefit from the United Kingdom’s assistance in the fight against cybercrime. 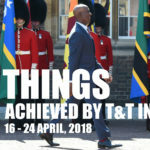 In bilateral talks held between Trinidad and Tobago and UK’s Minister of State for the Commonwealth and the United Nations, Lord Ahmad focus was placed on the strengthening of security cooperation between Trinidad and Tobago and the UK specifically in the areas of cybercrime and human trafficking. As such, Trinidad and Tobago stands to benefit from the £15 million allocation recently announced by Prime Minister May. Dr the Honourable KeithRowley led a delegation to meet with executives of BP at the company’s headquarters in London. The parties identified and discussed outstanding issues and went on to exchange proposals for their resolution. It was agreed that the parties would work assiduously towards the resolution of these issues in a manner that would be mutually beneficial to both parties. They also agreed to meet from the second half of May 2018 to commence negotiations on issues associated with Atlantic LNG and LNG matters. BP confirmed its commitment to work with the Government of Trinidad and Tobago in developing and strengthening the long-term future of the gas industry in Trinidad and Tobago. Prime Minister Dr the Honourable Keith Rowley raised the issue of countries making inaccurate pronouncements on Trinidad and Tobago saying that this practice has an adverse effect on the nation’s ability to stimulate growth and development. The Prime Minister was speaking at the Commonwealth Business Forum (CBF) Heads of Government Roundtable when he made the comment. He noted that Trinidad and Tobago pursues tourism as a viable industry for growth and development but when some nations issue negative travel advisories on incidents of crime, efforts made in the industry are stymied. Prime Minister Rowley advocated for a change in this regard. Dr Rowley also raised the subject of the categorisation of Trinidad and Tobago as a tax haven. This, even though the twin-island state continues to make significant steps towards fulfilling the requirements of the European Union and is FATCA compliant. Minister in the Office of the Prime Minister and Minister in the Office of the Attorney General and Ministry of Legal Affairs the Honourable Stuart Young attended a number of meetings with respect to national security matters of mutual interest to Trinidad and Tobago and the United Kingdom. The meetings included discussions with the National Crime Agency (NCA), the Counter Terrorism Command of the Metropolitan Police (SO15) as well as other agencies. This as Government seeks to do all in its power to address crime at all levels. Dennis Moses, Minister of Foreign and CARICOM Affairs accompanied by His Excellency Orville London, Trinidad and Tobago’s High Commissioner to the UK represented Trinidad and Tobago at a meeting with Lord Ahmad, Minister of State for the Commonwealth and the UN at the Foreign & Commonwealth Office, UK and The Rt Hon Caroline Nokes, Minister of State for Immigration at the Home Office, UK on 16 April 2018. A second meeting on 17 April 2018 saw Heads of Government and representatives of CARICOM Member States, Prime Minister Theresa May focused once more on the said issue. Other matters of concern to CARICOM States including correspondent banking, derisking, climate change and access to overseas development financing were raised during the meeting. Prime Minister May apologized for the challenges and inconvenience faced by those affected and reiterated appreciation for the value of the contribution made by the “Windrush generation”. Prime Minister Dr the Honourable Keith Rowley led a delegation of energy experts to meet with Shell executives in London on April 16, 2018. The parties agreed to establish empowered negotiating teams that will meet from the second half of May 2018.These teams will work on a priority basis, on a number of matters including, but not limited to, Atlantic LNG and the socio- economic contribution of the LNG business to Trinidad and Tobago, extensions of various upstream Production Sharing Contracts (PSC), Venezuelan initiatives and new domestic gas arrangements. It is expected that the negotiating teams will report back to their principals with agreements by September 2018. The parties agreed that they are working towards the securing of the long-term future of the gas industry in Trinidad and Tobago. Prime Minister Rowley met with members of the Trinidad and Tobago diaspora living in the United Kingdom (UK) at the Amba Hotel Marble Arch in London on April 23, 2018. The event was organised by the Trinidad and Tobago High Commission led by His Excellency Orville London, Trinidad and Tobago’s High Commissioner to the UK. In addition to delivering an address, Prime Minister also engaged in a question and answer segment with the audience and interacted with them personally following the formal proceedings.